Des is worried that his boss will make him go abseiling. Nick tells Matt that there's nothing between him and Lee. Sharon faints after sunbathing on the beach. Rhys real parents blackmail Beverly for more money. Sharon has come round and Matt and Nick have dragged her into the shade. Her head is thumping. They give her a drink and decide to take her off to Casualty. Beverly arrives home with Rhys. Helen asks her if she's OK - she looks a bit weary. Helen offers to take Rhys, but Beverly insists that she's fine. Des is cooking and nursing a bad back. There a ring on the doorbell and it's Jim. He asks Des about the figures Des has been doing. Des mentions the $1,000 personal expenditure and Jim is very surprised. Sharon is back from the hospital and is feeling awful - her skin is extremely painful. They all tell her off for frying herself, but she says she's suffering enough without a lecture. She goes off for a cold bath. Matt tells Lee that he's sorry for being suspicious about Nick. Lee tells him he doesn't own her. Jim comes in for a quiet word with Beverly - about the $1,000. Just then, the phone rings and it's Rhys's parents. Beverly tells them on the office phone that she'll pay them in a couple of days. She goes out before Jim can finish talking to her. Matt is still trying to talk Lee around. She isn't happy and says that Matt is more possessive than her parents. Matt says he doesn't normally get jealous, but he missed her so much when he was away. He promises not to do it again. Sharon staggers into the kitchen, still in agony. Lee goes off to help her get dressed. Des and Paul have been playing squash and Des is worried that he might have a heart-attack(!) 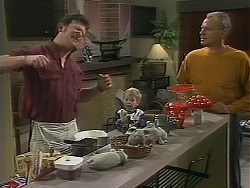 Paul says he could always chuck his job in, but Des doesn't want to - he'll just have to get fit. He feels that when it comes down to basic ability, he's just as good as all the young yuppie types at work. Matt has turned the music up very loud, so Lee goes to turn it down. On the volume knob is a note titled "I'm sorry" and there are several others around the room too! 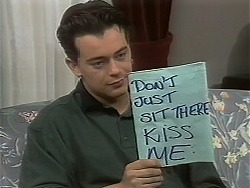 The last one says, "Don't just sit there, kiss me", so they have a make-up pash. Matt promises not to be possessive towards her ever again and Lee agrees to forgive him. Paul has rented out No.24, but he doesn't know who the new tennants are. He's settling in quite well at the hotel. He's holding interviews for the Assistant Manager position today. Jim comes in and tells Beverly to stop avoiding him. He tells her about the $1,000 and she is forced to admit to him about the baby bribes. 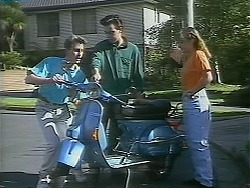 Matt and Nick are off for a spin on Matt's new scooter. Sharon is still limping around. Matt wants to make some improvements to his bike and Nick suggests he could draw up some ideas. 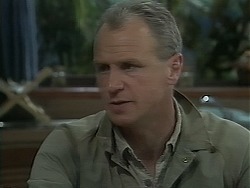 Des comes in to see Paul - his boss has asked him to go abseiling. He's almost beside himself. There's no way he can say no to his boss. Paul says not to worry - Des's boss (Sinclair) will have all the best equipment and it could be fun! Des doesn't look convinced. 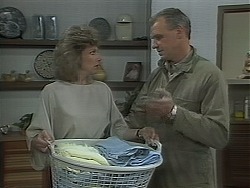 Jim tells Beverly that they can't continue to pay Rhys's parents. Jim doesn't want to lose Rhys either, but they can't put up with blackmail.